The Copenhagen Opera Trio have been at the summit of Danish and international entertainment for a decade with professional opera shows. 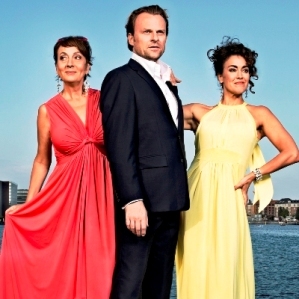 The Copenhagen Opera Trio offer an exclusive experience of seductive harmonies close to life with passion, charm and humour. Their repertoire is extensive and stretches from Mozart and Puccini to pop, musicals and evergreens. The Copenhagen Opera Trio create sophisticated and humorous concepts that reach beyond the traditional opera audience. Opera lovers as well as “new beginners” are brought into the magical world of opera through carefully selected musical pieces from operas, operettas, musicals, pop songs and evergreens. You can have your programme customised for a company party, a conference or for a very special event. The Copenhagen Opera Trio perform with their own pianist, with the Wiener Trio and the Danish Radio Orchestra . The singers master Swedish, English, French, Italian, German and – last but not least – Danish. Zangers heeft geschenen op de top van de Deense en internationale entertainment in een decennium van professionele shows. Zangers levert een exclusieve ervaring met verleidelijke harmonie stevig in het leven met passie, charme en humor. Het repertoire, variërend van Mozart Puccini tot pop, musicals evergreens. Zangers creëert verfijnde humoristische concepten. Concepten die zich uitstrekken buiten de traditionele publiek. Zowel operaliefhebbers inzending 'nieuwkomers' in de opera's magisch universum met een zorgvuldig samengestelde selectie van geselecteerde opera's, operettes, musicals, popsongs en evergreens. Krijg programma op maat doordrongen het bedrijfsfeest, conferentie of speciale gelegenheid. Zangers gebeurt zowel met hun eigen pianist, Radio Salon Trio en orkest. De zangers spreken Zweeds, Engels, Frans, Italiaans, Duits, en last but not least het Deens. Kernen i deres musikalske univers er folkemusikken – især den irske, men de bevæger sig ubesværet rundt i mange stilarter, så både den klassiske musik, jazzen, rocken og popmusikken var med på programmet. Danmark har vist sig at være den helt rigtige base for deres musikalitet.